Certified Registered Nurse Anesthetists (CRNAs) are advanced practice registered nurses who administer approximately 43 million anesthetics to patients each year in the United States. In some states, CRNAs are the sole anesthesia professionals in nearly 100 percent of rural hospitals, ensuring patient access to obstetrical, surgical, trauma stabilization, and pain management services. CRNA services include pre-anesthesia evaluation, administering the anesthetic, monitoring and interpreting the patient’s vital signs, and managing the patient throughout surgery. As the primary hands-on provider of anesthesia care in both civilian and military healthcare settings, CRNAs practice in every type of facility where anesthesia is required for patient care. That includes but is not limited to hospital operating and delivery rooms; ambulatory surgical centers; the offices of dentists, podiatrists, ophthalmologists, and plastic surgeons; pain management centers; and all U.S. Military service branches, Public Health Services, and Department of Veterans Affairs medical facilities. 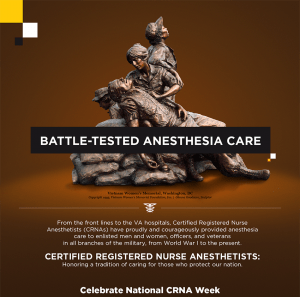 CRNAs have been the main providers of anesthesia care to U.S. military personnel on the front lines since WWI, including current conflicts in the Middle East. Nurses first provided anesthesia to wounded soldiers during the Civil War. 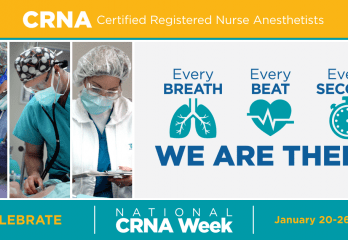 National CRNA Week was established by the American Association of Nurse Anesthetists (AANA) to encourage CRNAs to educate the public about anesthesia safety, questions to ask prior to undergoing surgery, and the benefits of receiving anesthesia care from a nurse anesthetist. To learn more about the AANA visit www.aana.com/ or www.future-of-anesthesia-care-today.com.